Conley Equipment Company takes batteries seriously. As your Top Rated® National battery supplier with a 4.8 out of 5 overall satisfaction rating, we want to ensure we provide only the best products for our clients. That’s why we’ve worked hard at our 20-year relationship with East Penn Manufacturing. As the largest value-added reseller for East Penn Manufacturing in North America, we have the opportunity to provide our customers with the best battery portfolio across all markets that we serve. Our goal is to offer a wide range of top-quality products and services that are designed to meet any and all of your power needs. 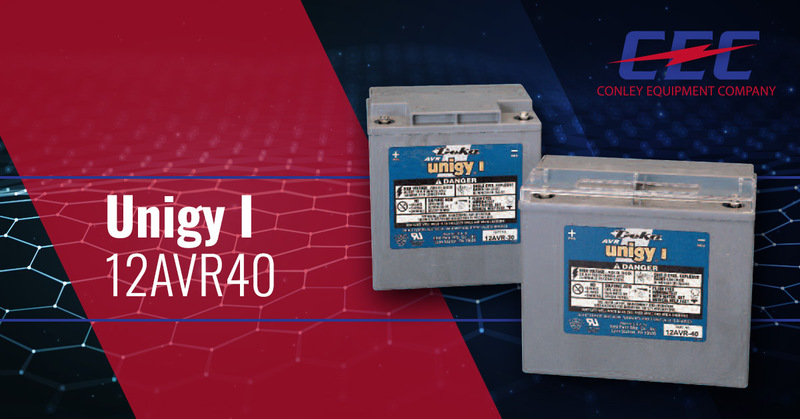 When you choose East Penn’s Unigy I – 12AVR40 battery you have a reliable telecommunications battery which gives you the power you need — wherever and whenever you need it. Since East Penn started in a small one-room creamery in 1946, they’ve become the largest single-site battery manufacturer in the world. Their Unigy I battery features a top terminal design and a pure lead, low-calcium, high-tin alloy positive plate. It’s designed to last five years in float applications. It weighs 21 pounds and boasts advanced AGM technology which gets rid of the problem of perioding watering, corrosive acid fumes, and spills. When you work with Conley Equipment Company and East Penn Manufacturers, you can be sure you have a trusted telecommunications battery system you can rely on. If you’re ready to order, or you’re simply looking to find out more, please fill out the contact form to the right to get the process started. Or if you’d like to read more about the Unigy I – 12AVR40 battery, please click here to view their helpful cut sheet.